Community College Success: New to the blog? Start here! Hi and welcome to the Community College Success community! I'm Isa and I started this blog in 2010 because I believe community colleges are filled with talented students like you who just need more support and strategies to complete college. 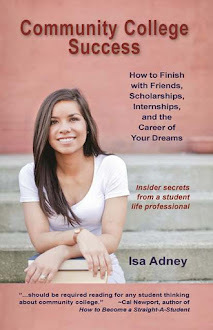 The blog inspired the book Community College Success, and I hope you'll also find that helpful. Since 2015 I've gone on hiatus from this blog as I've been working diligently on my next book about pursuing dreams. While I'm no longer writing new content for this blog, I hope you'll find much of it still relevant and helpful to your journey. Much to my surprise and joy over ONE MILLION people have visited as of 2016!! Whoa. I wish you all the best of luck on your journey. Community college can be the beginning of an incredible journey if you choose to make the most of it. I hope you do.